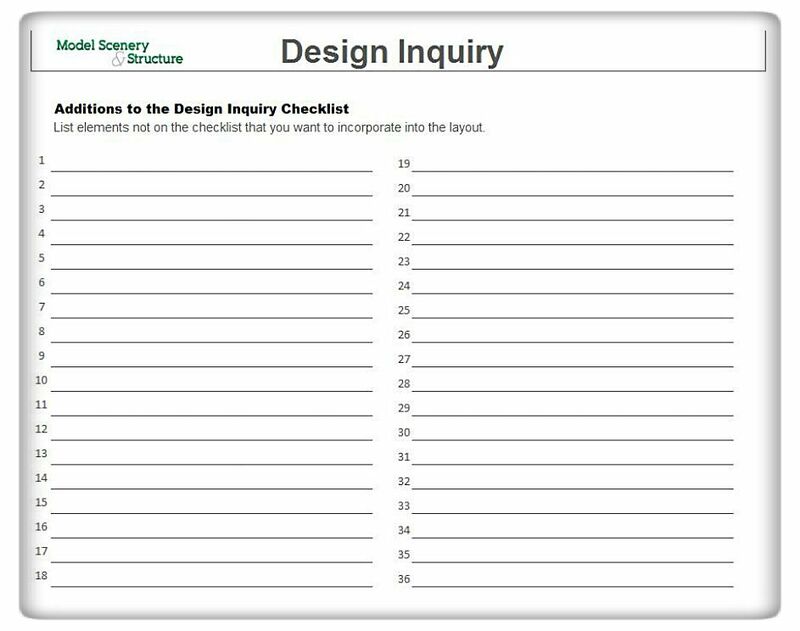 DOWNLOAD the Design Inquiry Form to your computer. Click here, the file will open. Then Enable editing (if necessary) and save the file. Be sure and rename it. Open the newly named file. Put X’s in the appropriate boxes and fill in the blanks. Save the completed form. Now you can email the form back to us. If you have trouble downloading call and we’ll help. 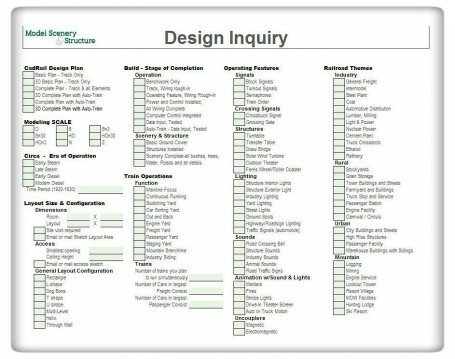 We can mail you the Design Inquiry Form. You can fill it out by hand and mail it back to us. We’ll even include a stamped and addressed envelope to make it easy to send the completed form back. The information on the Design Inquiry Form will provide the data base we will use to create the layout design, material lists and to estimate the various costs of the project. Checking off the items that you would like to have included in your Model Railroad is a critical piece of the planning process! 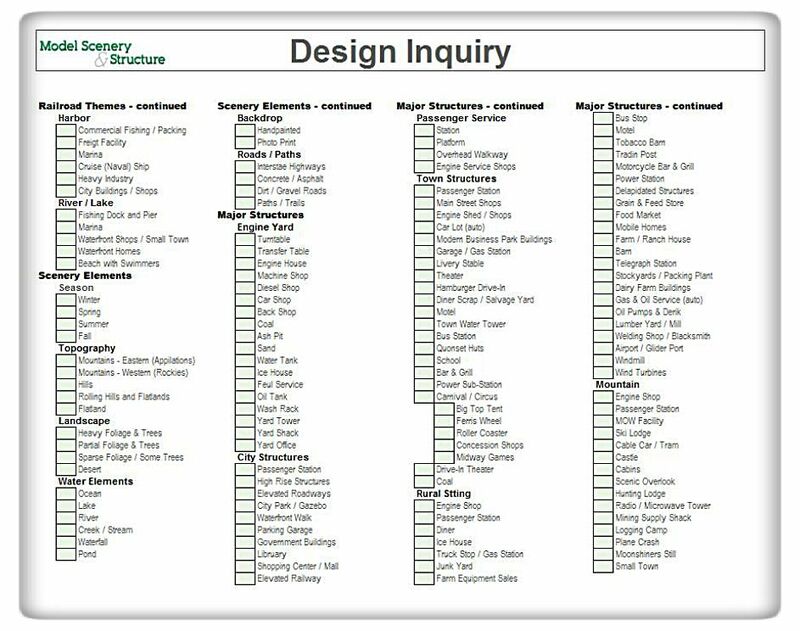 The checklist will get you thinking so if anything comes to mind but is not on the Design Inquiry Form write it down. At the end of the form there is an area where you can write in additional items. Upon receipt of the completed form, along with any of you notes or thoughts, we will contact you. There are generally a ‘few’ questions that come up during the form review. Then we will put together an estimate for the Basic Track Plan and provide any other information you may request. If you already have a plan or sketch prepared that represents part or all of your ideal railroad we would appreciate a copy. The same goes for any articles, photos, drawings, sketches or lists that pertain to the proposed layout. The more information we have the better we will be able to produce a layout that will fulfill your expectations. Don’t Really Know What You Want? If you have no real ideas in mind of that perfect layout and you just want a great Model Railroad from any era in any setting we can create a terrific layout for you. Call us or email a note with rough dimensions of the layout area you have available. Additionally, any ideas like “the Locomotive in the movie ‘Wild Wild West’ winding it’s way through the rolling hills of northern Texas” would be helpful. Tell us the stage of completion you’re looking for and that is all we need. Model Scenery & Structure will prepare an estimate for the Basic Track Plan and share with your our thoughts and recommendations for a layout that will get you up and running. It’s that simple . . . . Get started TODAY! 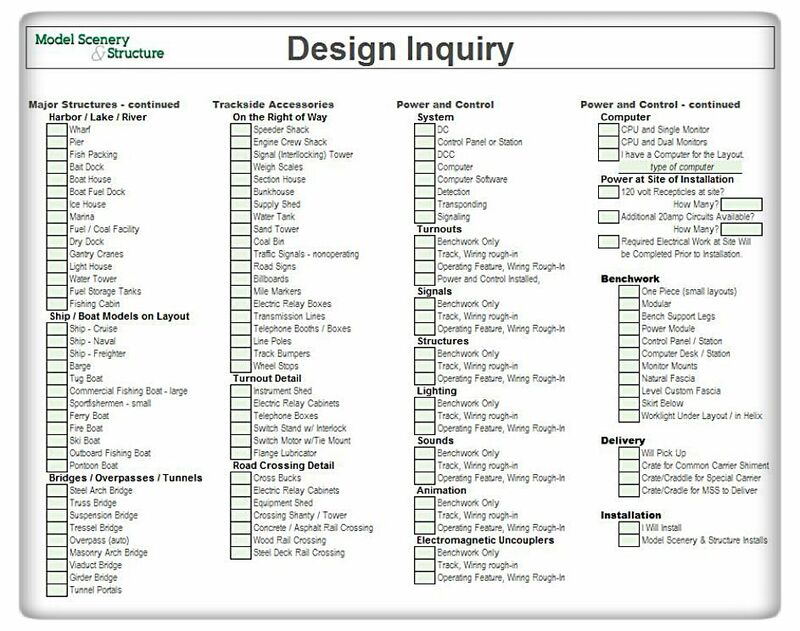 Shown below are samples of the five Design Inquiry Form pages. These are shown to display the content only. Please use the downloadable forms to indicate your layout preferences. 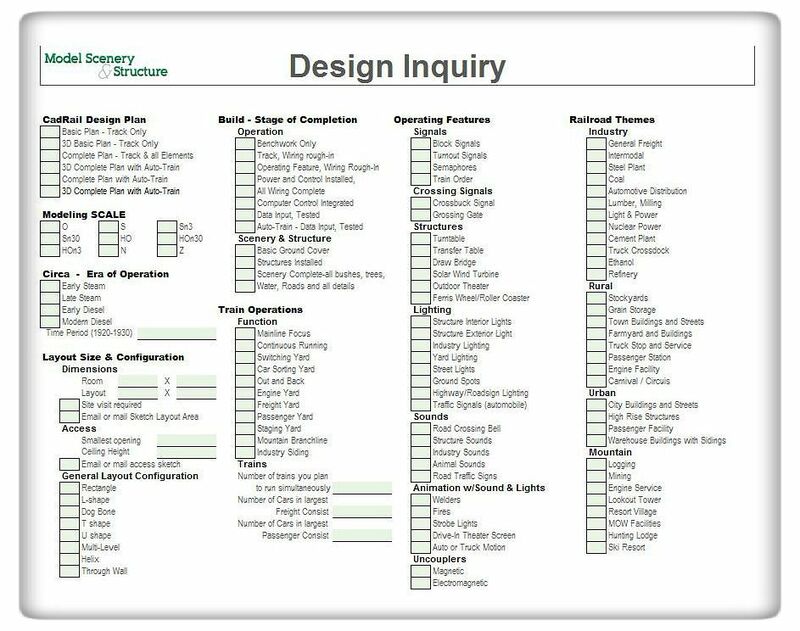 The DOWNLOAD Design Inquiry Form can be saved and then used as an attachment on an email that can be forwarded back to Model Scenery and Structure. The samples below can not be filed on your computer or forwarded back to us. 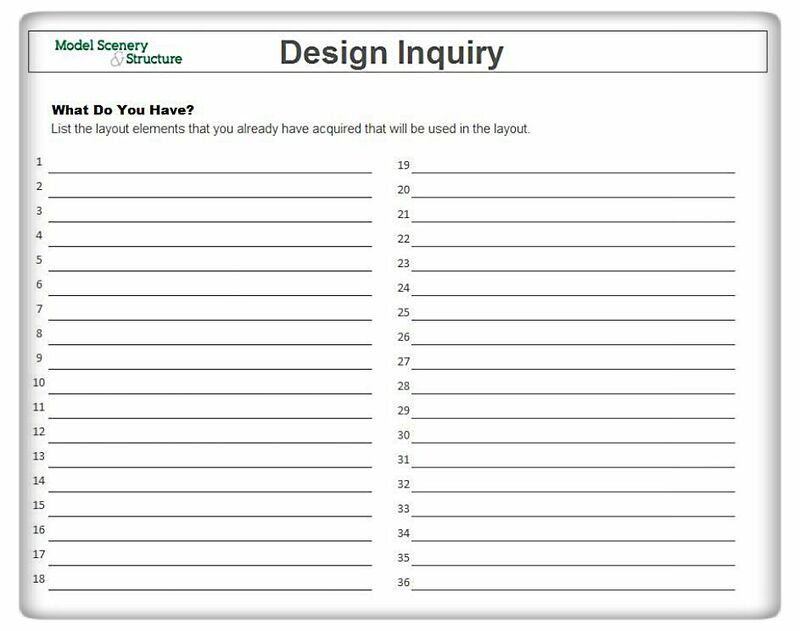 To get a better look at the Design Inquiry Forms click on each page below to see a larger image.